WTI crude prices remain in the range of $46.00-$46.50/b this morning. WTI opened at $46.49/b today, an increase of $0.14, or 0.30%, above yesterday’s opening price. Current prices are $46.36/b, $0.07 below yesterday’s closing price. WTI crude prices have opened slightly higher for the past two trading sessions. 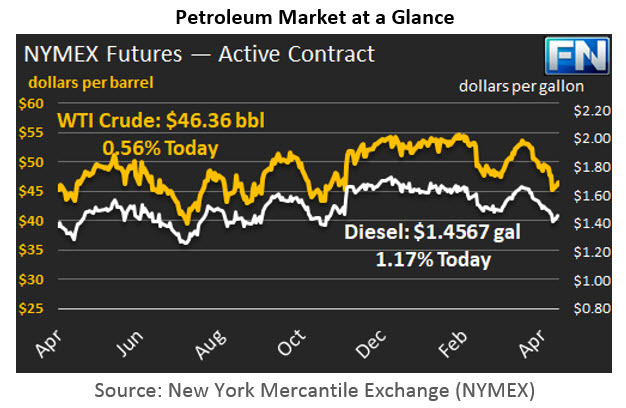 Product prices also have risen in the past two sessions, rebounding more strongly than crude. Diesel opened at $1.459/gallon in today’s trading session. This was an increase of 1.25 cents (0.86%) above yesterday’s opening price. Current prices are $1.4567/gallon, a small increase of 0.11 cents from yesterday’s closing price. Like crude, diesel prices have opened higher for two days in a row. 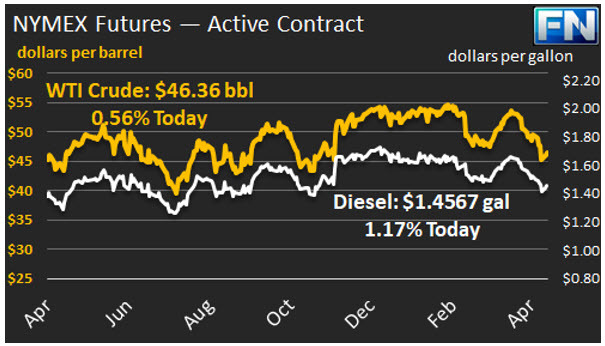 Prior to this, however, diesel prices had opened lower for twelve of the last thirteen trading sessions, shedding 16.84 cents, or 10.2%, since April 12th. Gasoline opened at $1.5234/gallon today, up 1.69 cents, or 1.12%, from yesterday’s opening. Prices are $1.5211/gallon currently, an increase of 0.33 cents above yesterday’s close. Like crude and diesel, gasoline prices have risen in the last two trading sessions. Prices moved down significantly between April 12th and May 5th, with gasoline prices opening lower in fifteen of the sixteen trading sessions. Prices fell by a total of 28.14 cents, or 16.0%, during the April 12th– May 5th period. Some analysts have noted that the increase in prices may be the result of bargain hunting rather than any solid change in today’s fundamentals. OPEC has been more forceful in its statements regarding an extension of the production cuts through the end of 2017, even contemplating a cut that would go below current levels and perhaps continue into 2018. Most investment houses and analysts forecast that the global supply-demand balance is improving. The Schneider Electric industry survey is pointing to a drawdown of U.S. crude and product inventories of approximately 1-2 mmbbls crude and 1 mmbbls gasoline and distillate this week. The market will watch for API and the EIA data on stock movements. The EIA has released data on gasoline and diesel retail prices for the week ended May 8th. At the national level, gasoline retail prices again dropped significantly, by 3.9 cents/gallon, and diesel prices declined by 1.9 cents/gallon. The crude price slump has been reflected in product markets over the past two weeks. Prices fell in all PADDs and major submarkets across the country. Details follow in our second article.